Sail charter operator Jerry Correia is expressing grave concern over the government’s plan to close Swing Bridge for maintenance, outlining the effect that such a move will have on local charter and marine tour businesses. 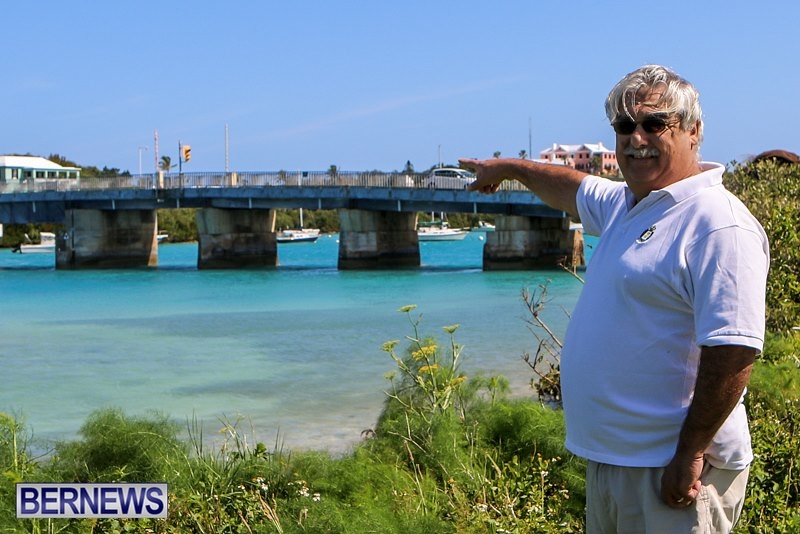 Mr. Correia said, “I need to speak out again one more time as much as I can to try to get our government and the folks here in Bermuda to understand the severity that is involved in the closure of this bridge. “I need to go back in time a bit to understand why I am what I am and why I am upset the way I am. The way to do that is to start 20 plus years ago when I had the privilege of being the first tour here in St. George’s. For that reason I also had the privilege of using the Longbird Bridge back at that time. “Again, we had the options of going through Castle Harbour or out and around and down the North Shore with the use of both bridges. As we all know, that eventually came to pass that that too, that bridge met the same fate that this one seems to be going the same way. “Again, we were told that the bridge needed maintenance and all of that and we agreed that it did and they said that they would close it, repair it, and then we would see it open again. As we are now knowing, there are two Bailey bridges alongside and it’s temporarily, permanently closed. “With that said, the years have gone by and we have adapted to doing the one tour around with our visitors. They enjoy it, although we miss out now on the beautiful Castle Harbour and the excellent swimming and snorkeling that is over there. However, we are continuing, as I said, on this side. “With that said, I am proud to say during those 20 years I saw the first ships come into St. George’s; the Majesty and then the rotation of the other ships from Hamilton into St. George’s and during that period of time, we were averaging about 15 trips a week. Obviously, I was paying my bills back then and enjoying a good charter business. “Again something else takes place here in St. George’s. The ships stop coming in. In doing so, my trips now are probably three trips a week if I’m lucky. With that said, with the closure of this bridge and all of us that are involved in this, so I’m speaking not just for myself but for my commercial friends who are supposed to be here. Mr. Correia added, “With the closure of this bridge, if I can explain why it is so important; I can now do as I mentioned on my previous thing, is that I can do a circle tour. I can do a historical narration about St. George’s. Everything is there. Depending on which way the wind blows is which way I will do the tour. With the bridge now closed, any easterly heavy winds I am now contained to the St. George’s Harbour. Minister Gordon-Pamplin said, “The Ministry of Public Works understands and appreciates the concerns of several of the island’s charter boat operators who feel the closure of the swing bridge this summer may jeopardize their businesses’ economic viability. “As Minister of Public Works, I can assure these individuals that I am fully cognizant of their fears and therefore I would not make the decision to keep the swing bridge closed without sound technical advice. Upon speaking with my senior engineers, I have determined that it is, in fact, absolutely necessary. “Put simply, works must go ahead in order to maintain the safety and security of the bridge. The bridge simply cannot be opened, as to do so may compromise the safety of those road users who traverse the bridge. “The very real possibility exists that overdue maintenance can cause the bridge to open and not be able to reclose, which would leave residents and tourists alike stranded on one side of the bridge. This is not a situation I would ever like to see happen – especially not during peak tourist season. “There has been a significant amount of deterioration to the beams of the bridge due to the action of sea water and therefore repairs must be made. “It would be negligent for the Ministry to open the bridge this summer,” added the Minister. Mr. Burgess said, “The excuses provided by the Minister of Public Works, the Hon. Patricia Gordon Pamplin, regarding the repairs to the Swing Bridge are insufficient and unacceptable to the public, and residents of St. George especially. “There was $450,000 allocated in the 2013/2014 budget for bridge refurbishment. In addition, no bridges were inspected in this same period. Had the government been on top of their game the repairs could have been done between October 2013 and now, and the bridge would have been ready for the summer season. “Now, unfortunately we are in a situation where businesses and peoples’ livelihoods are being compromised due to the inattention paid to the Swing Bridge by the OBA government. Then Mr Burgess, how is it that the Bridge is in the state it is? Why was NO maintenance done during the previous governments tenure? If this bridge breaks down, what will the people of St. Georges do? We’ll need to build an Urgent Care Center in St. Georges. If the bridge is closed for such a long period as proposed, it will likely rust out beyond repair from lack of usage, so in the long term it would cost even more. Let’s not be so short sighted. Because if the seas are rough it is very dangerous to go the long way around. Know something before you make ignorant comments. Glad that you understood that comment. I read it over a few times & made no sense of it at all. How ABOUT the Bailey bridge, temporarily permanent. Is the government going to fix that? It’s been to long and neither governments of the day have addressesed this problem to find a permenant solution. The current Govt did address Long Bird Bridge, there is no money to replace it. The plan now is to along with finding an operator to rebuild the new airport (which will likely not happen), to also build a new bridge. More green chickens coming home to roost. Years of neglect. Years of little or no usage. Years of promises of bridge replacement (Longbird/Causeway). Years of nothing to show in the area besides “Pop Bye” flags. Voters of Bermuda, you got what you voted for. You got what you deserved. Much is expected of the OBA but they cannot snap their fingers & make things happen, not with maintenance on a PLP debt costing over $200,000.00 per day. What part of broke do people not understand? True, the refurbishment of the Swing Bridge is going to cost more by delaying it but if the money is not there, the money is not there. Ideally work should have started on the bridge last September, at the end of the season however W&E have demonstrated in the past that they have little consideration for the users of bridges when it come to such things as the timing of maintenance. They pulled the same thing the last time Somerset Bridge was rebuilt. Work did not START till March closing the bridge to boats for the whole season as work dragged slowly on. GET RIDE OF W & E then you might see something getting done. (2) pay TAXES to a smaller Government. (3) And get the work done. The PLP/BIU gave us a HUGE DEBT of $2.324Billion dollars and did nothing. the blame lays solely on the defunct plp and their friends n family plan. Thankfully it’s GAME OVER for them. Remeber the ‘temporary’ bridge at the airport end of the Causeway…. Mr Wart Brahn installed just before StG Cup Match several years ago – I see it’s still temporary…!! Yup, had a big party for the opening of it too. You would have thought that they had really accomplished something. Much adoo about nothing as usual. Mr Cranbayfield is correct. The bridges at the airport were put there to have a life of four years. Seven so far. When one collapses under the weight of a huge oversized truck full of aggregate, something will be done, but only after we have one way traffic for another couple years. While I fully appreciate the responsibility of governing, and for making difficult decisions, it is still difficult to understand the temerity of the PLP former Minister who can criticize that the OBA were not on top of the bridge repairs. File records show that the bridge’s last full service was at least ten (10) years ago. And what of all the money that was in your budget that you didn’t spend last year.. you could have done the work in the winter, but your premier was too busy travelling so the bridge and St. George got the short end of the stick. In the end, they shouldn’t have to raise or swing any bridge. Use the watford model, Jerry Correia has to go agound until this piece of junk is fixed. The bridges should have enough air draft for the ferrys to pass under & be fixed. If opening they should be a simple single span drawbridge design. Congratulations to Jerry Correia for sticking it out for so many years in St. Georges and offering a sailboat/snorkel trip to the visitors. As he quite rightly says, he was there at the very beginning, even before the Norwegian Majesty became a weekly visitor, and sadly he will probably be the ‘last man standing’. The closure of Swing Bridge for the summer season will probably be the final nail in the coffin for his business. St. Georges used to be a vibrant tourist destination with one cruise ship on a Monday, two on a Tuesday, Wednesday, Thursday and one on a Friday morning. In addition there was an occasional weekend caller. Tour operators, including Jerry Correia, used to have access to a variety of beautiful tour loops by using the Swing Bridge to do a circular tour of St Georges harbor, Fort St. Catherine, Whalebone Bay, Grotto Bay and Ferry Reach. Best of all the tours could be modified, clock wise anticlockwise to accommodate weather conditions. The tourists that did those tours probably still talk about them today, because they were so spectacular. Sadly, the bridges no longer work, the cruise ships don’t come any more and most of the tour operators packed up and left a good few years ago. I wonder what percentage of visitors coming this year will see the inside of Castle Harbour or the spectacular reefs from St. Davids Head to Castle Island – not many! Jerry Correia has dedicated 20+ years to running his sail and snorkel tours from St. Georges and along the way he has made a lot of friends and created many happy memories for visitors to our island and it is sad to see him being put out of business like this. Is it really so difficult to keep the only ‘opening bridge’ in Bermuda in working condition for a 4 month tourist season? Make no mistake: Once this bridge is closed, it will NEVER EVER be opened again. This is Government’s intention – there will never ever be a swing bridge there again. In fact, we’ll no longer be able to call it the Swing Bridge – for the simple reason that it won’t swing anymore. You know it, I know it, Jerry knows it, Sloan knows it. The Swing Bridge will be part of our history. I hate to have to say it but Bda Boy is right. The bridge was enormously expensive to operate, and used by a minute amount of people – especially when there is another way around. It is an expense we simply can no longer afford – sorry about Jerry and all that but it is true. I wonder what the life expectancy of the current, temporary Bailey Bridge. Has it been recently inspected? Is it still safe? Ugggghhhhh Derek! You should have held back on you comments man. I am a fan but pls dont misrepresent me. You know full well the bridge has to be closed in order to be fixed. What happens after that regarding it opening back up is the issue not the repairs!! You kno why the bridge hasnt been fixed yet! EVERYTHING COSTS MONEY THAT WE (Bda) Dont Have!